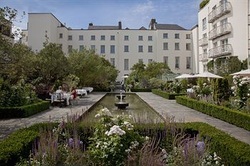 The Merrion is, without doubt, one of the finest hotels in the Republic of Ireland. It was formed by amalgamating four Georgian townhouses built in the mid 18th century, each one originally designed for wealthy merchants and nobility. Today it offers over 140 rooms to discerning visitors from across the globe, be they politicians, celebrities or those simply wishing to explore the city. Its primary historic significance is arguably that one of the original townhouses (number 24, to be specific) was the birthplace of a certain Arthur Wellesley - the man better known to history as the 1st Duke of Wellington. Five-star rated, the hotel boasts two restaurants: The Cellar (for traditional Irish cuisine), and the Restaurant Patrick Gulbaud (which has two Michelin stars).